You know the old saying "two heads are better than one"? This was certainly the case when I collaborated with Bird, the creator of Dog 'n Bird Artful Wedding. Come check out her beautiful site and the recipe I developed for her innovative idea: The Wedding Toast Truffle. Note: Several people have asked for the recipe because the Dog 'n Bird site is no longer in operation. A very nice commenter helped me locate the original truffle recipe. Enjoy! 2. Set a heat proof bowl over a small pot of simmering water. Add the heavy cream and champagne reduction to the bowl and stir until combined and hot. Gradually add the white chocolate and stir until melted and smooth. 3. Sprinkle over the gelatin and mix with a rubber spatula until combined. Mixture will thicken slightly and a little of the cocoa butter may rise to the top (pour this off). Cover and chill. Makes 12 small toasting truffles. omg, they sound (and look!) so good! They look lovely! Quick question, the red gelatin, is that the same as jelly crystals? Ohhhh, thats pretty brilliant. Somebody needs to throw a party soon. lovely photo! evokes such a nice emotion! These look lovely, Heather! I love the look of them in the champaigne glass and they're so deliciously pink. Wow. WOW! You are SO GOOD. I can't tell you how much I look forward to your beautiful and delicious looking posts. My mini donut pans are heading this way for a baby shower treat next weekend. You are an inspiration! Oh my, Heather. These look so pretty. I am going to head on over there to check out the blog and the recipe. That is a gorgeous picture too. Did you take it? Thanks so much for all the sweet comments! The gelatin I used is the plain ol' store-bought flavored gelatin, such as Jello brand. Chocolate coloring oils are sold online and in specialty stores and a few drops of red would do the trick if you'd prefer. I used red gelatin because it is accessible to everyone, and it isn't very noticeable flavor wise. Thanks for clarifying that Heather. Sometimes the different terms between the USA and Australia can be confusing. Those look gorgeous and the recipe is making me salivate. Delicious! They look and sound fantastic. We've got some pretty good pink bubblies here in NZ that would go well with that recipe. Might have to give it a go! Oh and now you've inspired me to buy a mini donut pan...just looking to see if anyone actually sells them here. Awesome! This is such a creative and delicious sounding truffle. Hi, Heather. Believe it or not, I came back to look at that gorgeous pink truffle again, just because it is so beautiful!!! So now I saw the answer to my question... well, you are doubly-blessed: you bake wonderfully, and are a first class photographer too! Heather, as always, your pictures make me want to lick my computer screen (well, nearly!!). Not only does everything look pretty, it looks like it would taste fabulous!! As always, looking forward to what you will prepare next!! I just found this site, and this post. I love this idea and would love to know more. However the links no longer work. I also tried the link and it doesnt work. Would it be possible to get the recipe. They are soo cute. Thank you. Snowed in at home with nothing to do but to shovel and bake, I came across your site and was enthralled with your photos, recipes, stories etc... I too started salivating at the pictures and wanted to make the pink truffles on this winter day rather than shovel. I also tried the link for the recipe and it was unavailable. Is it possible for you to re-post the recipe? Thank you. 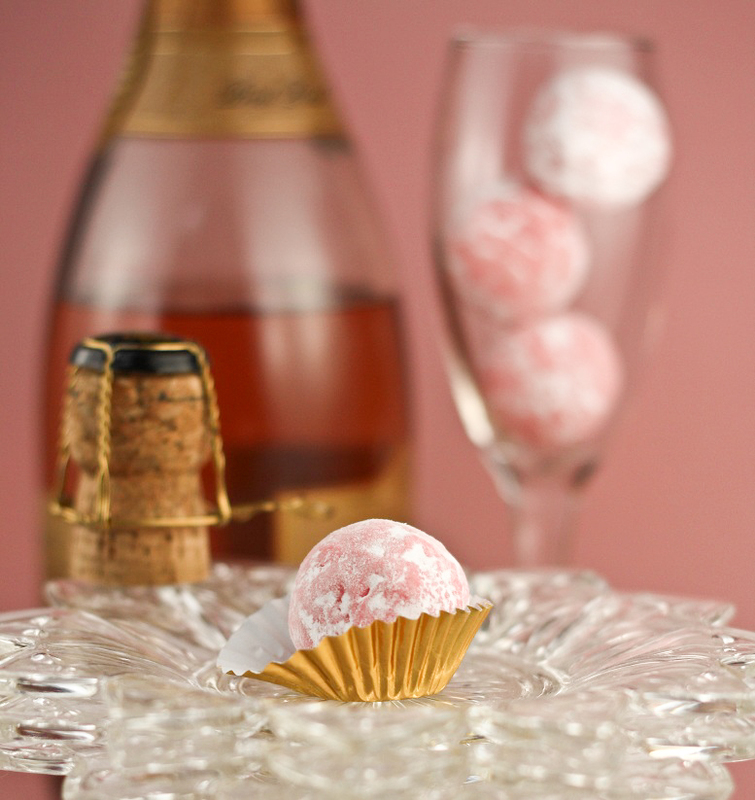 So very sad that the Pink Champagne Truffle recipe isn't available! Any chance at a repost? Hey all! So sorry I have not posted. Currently trying to get in touch with Dog'n Bird site manager to see if she will send me the recipe. I no longer have the recipe since I made this specifically for Dog'n bird wedding site. If she doesn't want it posted here I may have to email you all separately - so send me your email address via the contact button (little envelope) here in the upper right hand corner. Hi! I was hoping we could get you to post the recipe on your blog since the link seems to have gone inactive. Thanks! Recipe is up! Thanks all!